If you’re like me, full of questions and searching for answers, don’t overlook Consumer Reports as a valuable resource. This monthly magazine is always a wealth of reliable information for the practical side of life. I get several tips for my radio show from Consumer Reports. A recent issue included a column on making cars more efficient, advice on food expiration dates, which type of water heater is best, and an up-to-date guide to natural cures. I’m renewing my subscription. Perhaps you’d like one, too. Or gift it to a friend. “Tis the season. The Milky Way – that flood of stars splashed across the inky night sky … and the galaxy we call home – has been a source of wonder ever since humanity has had the capacity to muse about such things. It has served as a source of inspiration for ancient Egyptians and enlightenment scientists, modern artists and poets, and everyone in-between. And we’ve squandered it away, made it disappear; we're depriving generations of people from ever knowing its profound beauty. Thanks to our incessant obsession with artificial light, we have ruined the nighttime sky. More than 80% of the planet's land areas – and 99% of the population of the United States and Europe – “live under skies so blotted with man-made light that the Milky Way has become virtually invisible,” writes National Geographic. It is an enormous loss of nature; yet it’s one that brings, perhaps, the least distress to me. Restoring ruined nature is a generally a daunting concept, but restoring the night sky is easy: Just turn off the lights. 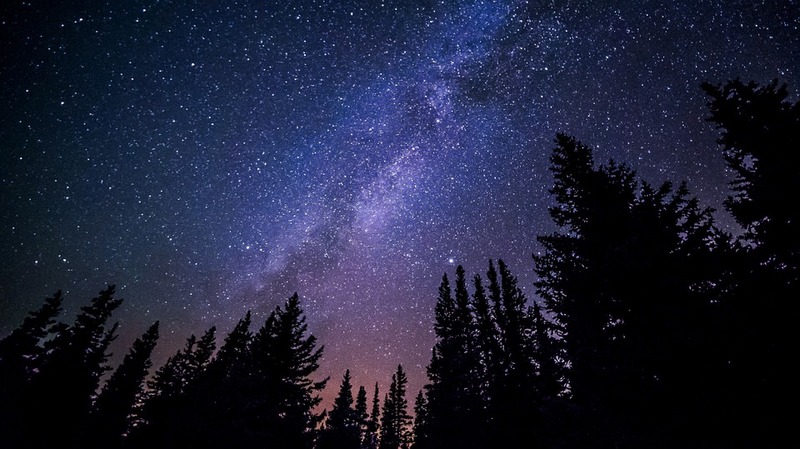 Toward that end the International Dark Sky Association has helped create 53 Dark Sky Parks throughout the world, including 37 in the United States. To find out where they are, check out darksky.org on the Web. In addition, there are only 11 dark sky reserves – which have a larger size requirement than parks – and none of them are in the U.S. But if the state of Idaho gets its way, the U.S. will soon have one. The state has applied to become the first-ever dark sky reserve in the U.S., the 12th in the world. The designation would be awarded to a stretch of land about 300 miles southeast of Boise – 1,400 square miles of Blaine County, Custer County, and surrounding areas. Kudos to the citizens of Idaho for embracing such a concept. (1) Live simply. Eschew fashion. Be practical. Don’t buy things you can’t afford. (2) Pay off your debts. Get to a position where you pay as you go. Don’t buy things you can’t pay for. (3) Invest wisely. I don’t invest in the stock market because I have no control over it. Instead, I focus on investing in my home and try to keep it maintained and as up to date as possible. (4) Don’t buy a car unless you can afford to maintain it. Walk. Take the bus. Ride a bike. There are lots of ways of getting around and getting your exercise at the same time. (5) Exercise daily. Studies show that exercise is the key to well-being and to long life. (6) Live in nature. Take cues from the cosmos. Pay attention to lunar and solar eclipses. Learn to identify the planets and find them in the night sky. Plant a garden. Feed the birds. (7) Simply love those close to you and treat strangers in need as close to you. (8) Minimize cynicism and maximize hope and optimism. (9) Believe, as I do, that democracy is self correcting, that truth is more powerful than falsity, that this is not a nation of hate but of pursuit of common interest. It will be hard, but people of good will can make justice and love happen. (10) Be a person of good will. Start in your life, every day. Make love a priority. Being frugal is intimately tied to living a green and sustainable life. By making do with less, you actively protest rampant consumerism and lessen—ever so slightly—the demand for new manufacturing and extraction of resources. Frugality also makes people happier. With frugality comes liberation from financial concerns, which brings a great sense of happiness. 1. Frugality allows a person to work less and have more free time. 2. Frugality promotes serenity through detachment. The less you have to do, buy, or maintain, the fewer things you need to worry about or feel attached to. 3. Frugality prepares you for tough times. If the crash of 2008 taught us anything, it taught us to prepare for tough times ahead—invest, save an emergency fund, buy insurance, establish a strong social network. 4. Frugality enhances your capacity for pleasure. People tend to appreciate luxuries more when they are fairly rare, so make “treats” a rare event, not an everyday occurrence. 5. Frugality fosters self-sufficiency and independence. A frugal person is less dependent on others, both in terms of interpersonal relationships and in terms of needing goods and services. 6. Simple living keeps you close to nature, which is—at it’s most basic—what it means to be green and sustainable. 7. Simple living promotes good health—fresh clean air, fresh fruits and vegetables, lots of outdoor exercise—where many elements of modern life tend to promote poor health—pollution, excessive noise, fast food, extreme stress, tight schedules. We are in the midst of extraordinary times, living in the wake of change and turmoil with an unpredictable future looming before us every day. Such lack of equilibrium shakes the psyche with anxiety, fear, anger, confusion. I don’t know anyone who hasn’t suffered from it in one way or another. In such darkness and confusion it’s tough being a human being, but it shouldn’t be. It’s ignorance that keeps us in that boat of suffering. That’s not the way it’s supposed to be. We’re all going to the same beautiful goal. That’s the way I see it. Whatever really and truly takes you there, we’re all on the same path. We’re all one on the most fundamental level. We’re all sparks off the Divine Flame. And we can realize that, perhaps not intellectually but we can live it. We can know it by being it. This is what mindful meditation does for a human being. You’ll know it by being it. It’s a field of pure knowingness. The practice of diving within in meditation makes ideas easier to catch. The enjoyment of the doing increases exponentially and you appreciate people more – you seem to almost recognize everyone. It becomes fun to work. It’s not the kind of thing you even think about, it just grows naturally. You can still get angry, but you can’t hold onto that anger. You can still get sad, but you can’t hold onto it. Negative emotions are what guides most of us. For one reason or another, you desire to go this way or that way. With a meditation practice you can still hit troubled waters, but at some point you say, “wait a minute, maybe I’m going in the wrong direction,” and you adjust. When you start getting the green light it’s an indication you’re going down the right path. I’ve found with meditation I enjoy life more, I have clarity, the ability to focus, and the ease in gaining knowledge. It’s the weirdest thing. It’s easier to meditate in a group. So if you’re interested, find one that meets at least once weekly and try it out. It’s a minefield out there in the real world. It can be tough to negotiate the pitfalls of advertising and politics, trying to distinguish between what’s real and what’s fake. Well, here’s a tip to help you through: Be mindful—in all you do, in every step you take. The ideal mental state is one of balance—being careful and thoughtful in all things. How you walk through life matters. Try to move along with earth’s natural rhythms. Remember, the earth's natural rhythm is medium to slow. Make that your rhythm, too. I've always wished I lived in Paris in the 1930s. Now I've gotten my wish, or come close. I live part-time in Vancouver, BC, the multicultural home of cutting-edge biologists and deeply spiritual philosophers solving age-old riddles of the mind-body connection. Their views make so much sense to me and are a critical aid in my personal evolution. Take Dr. Gabor Maté, for example, author of When the Body Says No and In the Realm of Hungry Ghosts. In the link below, this Hungarian-born medical physician, known for his work in palliative care and with addicts on the city's downtown east side, discusses his views on the widespread diagnoses of ADHD and depression, the link between healthy emotional expression and overall well-being, as well as how the body can be an effective teacher. Finally, Dr. Maté comments on how mental health issues can often be rooted in compensating behaviors from childhood and how healing can be approached from a bio-psycho-social perspective. (68 minutes) Worth your time. I've been steeping myself in Mate's YouTube lectures lately. This one spoke to me about our toxic culture. "The Power of Addiction and the Addiction to Power," ranging from drug addictions to addictions to oil and consumerism, to why the earth is in crisis right now, to finding the light within yourself to solve problems instead of looking to others. Another deep thinker who speaks to me on a spiritual level is Eckhart Tolle. Today I came across this gem. “Your life has an inner purpose and an outer purpose. Inner purpose concerns Being and is primary. Outer purpose concerns doing and it is secondary. Your inner purpose is to awaken. It is as simple as that. You share that purpose with every other person on the planet —because it is the purpose of humanity. Your inner purpose is an essential part of the purpose of the whole, the universe and its emerging intelligence. Your outer purpose can change over time. It varies greatly from person to person. Finding and living in alignment with the inner purpose is the foundation for fulfilling your outer purpose. It is the basis for true success. Without that alignment, you can still achieve certain things through effort, struggle, determination, and sheer hard work or cunning. But there is no joy in such endeavor, and it invariably ends in some form of suffering."